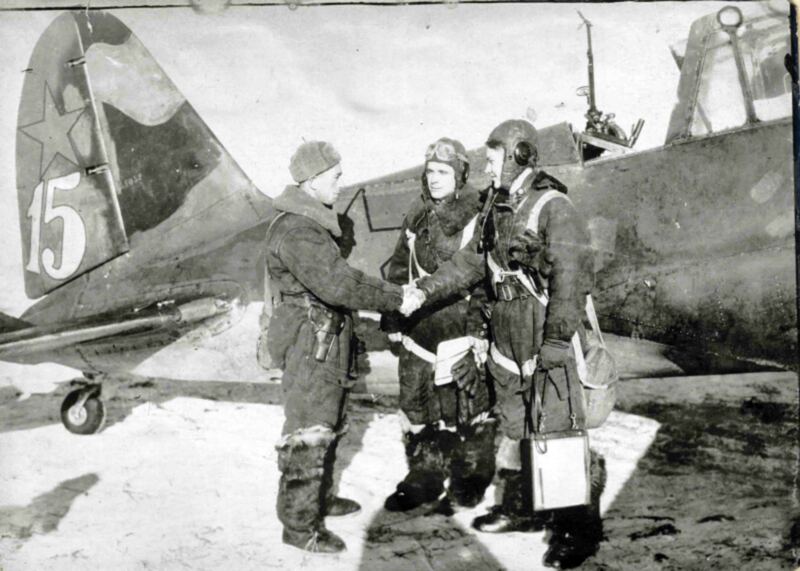 Congratulations by the commissioner Zinovy Abramovich Leshchinerom crew Su-2M-88B number 15 – navigator-shooter Petr Alekseyevich Zemlyakov and pilot twice Hero of the Soviet Union Grigory Flegontovich Sivkov after the first combat mission by a group of 9 aircraft to bombard enemy tanks that accumulated near the village of Slavyanskaya. Budenovka airfield, 3 squadrons of 210 Bomber Aviation Regiment. Photo from the archives of the families of Sivkov and Tarychev.